Drums With a Hint of Wild! 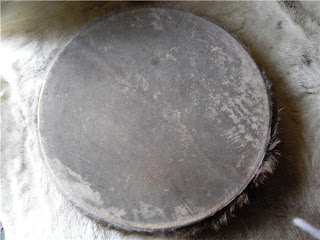 This incredible Mohican shamanic drum is made from WILD goat. 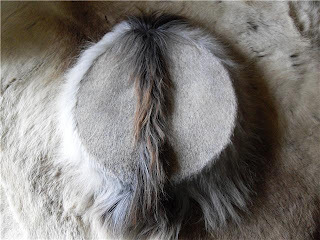 It measures 12" at its diameter and has been shaved to enhance the 'Mohican' fur line. The fur remains very long around the rim. This is a very special drum. This beautifully hand crafted and simplistic plain dark drum is goat (not wild). It measures 18" at its diameter. The hair has been kept long around the rim as is typical of my style of drum making. 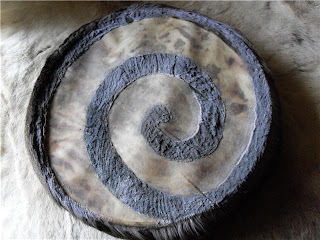 This very special shamanic drum is called a 'Crone' drum and is made from the hide of a Roe Deer. It measures 16" in diameter. The deisigns were hand painted using henna, indigo and blood. 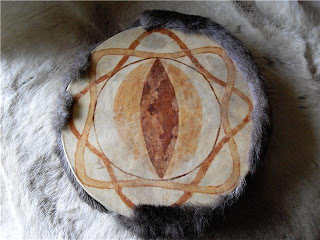 This beautifully decorated hand crafted shamanic drum is made from the hide of a Roe Deer. The Goddess design was hand painted in henna, indigo and blood. 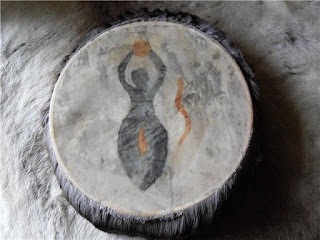 This beautiful hand crafted shamanic drum is made from the hide of a Roe Deer. It measures 16" in diameter and the design has been shaved into a spiral pattern. These special drums can be hand made and painted to specific requirements. These are no ordinary drums! They are made by me, from locally sourced skins on very beautiful and high quality solid frames, which are hand crafted in Scotland and blessed specifically for the person who will receive them. They are entirely unique and very, very special.